The Marco Island Marriott, LaPlaya Beach and Golf Resort, and the Ritz Carlton, Naples are some of the most exclusive places to have a wedding in South Florida. This photo was taken at the Marco Island Marriott Beach Resort. Marco Island is a city in Collier County, Florida. Originally named San Marco Island by Spanish explorers, Marco Island is the largest barrier island within Southwest Florida's Ten Thousand Islands area extending southerly to Cape Sable. Parts of the island have some scenic, high elevations relative to the generally flat south Florida landscape and like the city of Naples to the north, Marco Island has a tropical climate, specifically a tropical wet and dry type. It is known for distinct wet and dry seasons, with most of the rainfall falling between the months of June and October. Even though the rainy season does extend into October here in South Florida, October is one of our busiest months for Naples wedding photography. Dave and Kim had their wedding at the Marco Island Marriott in September. 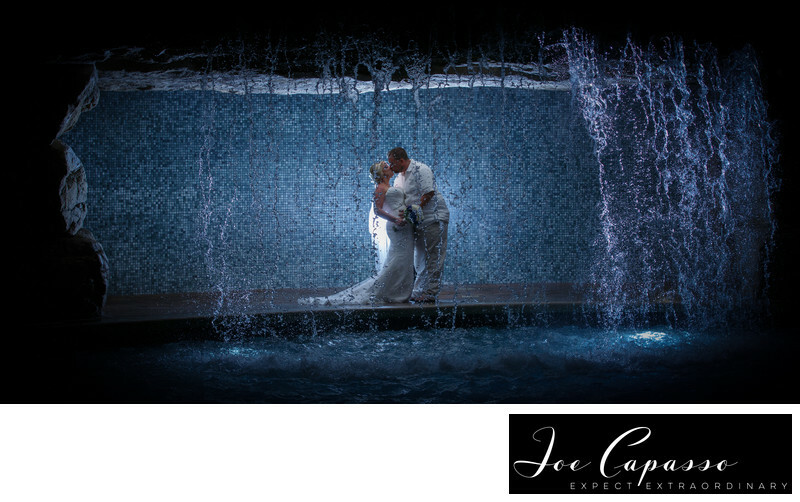 It was a hot night, but we were still able to capture some amazing photographs like this one underneath the pool waterfall at the Marriott. Here we placed a light behind Dave and Kim, while shooting from across the pool. The short flash duration allowed us to capture every detail of the waterfall in precise detail by freezing the motion of the water. This is just one of the many locations for great wedding photography around the Marco Island Marriott Beach Resort, one of Southwest Florida's biggest resort hotels. Location: Marco island Marriott beach resort, Marco Island Florida. Keywords: laplaya (21), laplaya beach and golf resort (24), marco island marriott (12), marco island marriott wedding photography (3), marco island wedding photographers (3), marco island weddings (3), naples weddings (12), ritz carlton naples (3).